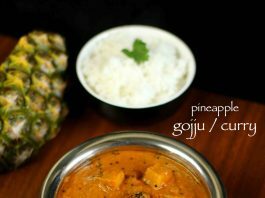 pineapple curry recipe | pineapple gojju recipe | ananas menaskai recipe with detailed photo and video recipe. 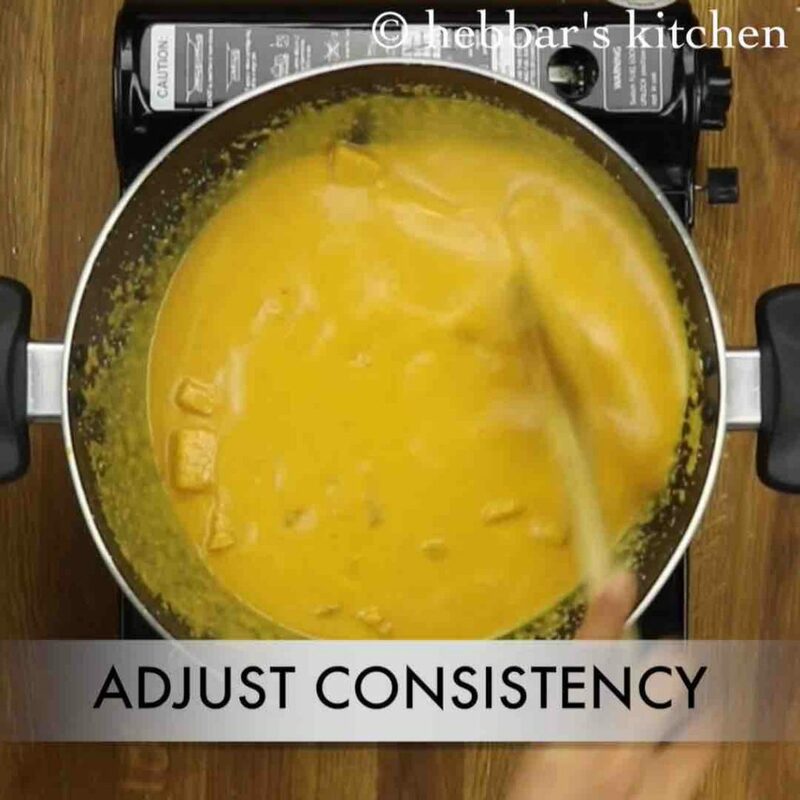 a perfect combination of multiple flavours in a single curry which includes sweet, spicy, sour and bitterness. it is typically prepared during for feast for religious and marriage ceremony and is served after rasam and rice combination. 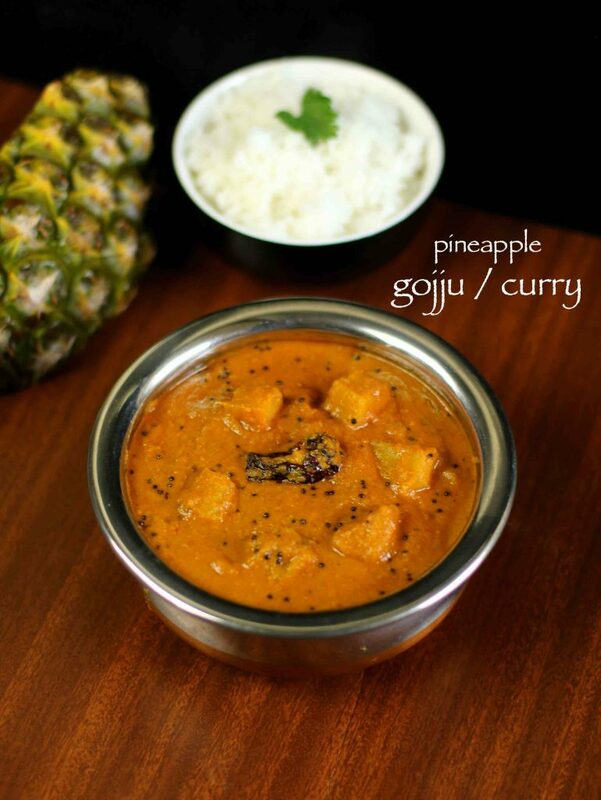 pineapple curry recipe | pineapple gojju recipe | ananas menaskai recipe with step by step photo and video recipe. basically, menaskai or gojju is a karnataka cuisine delicacy which can be either prepared from sweet / raw mango, bitter gourd and with pineapple. it is typically eaten as side dish to rice or it can also be served for dosa and idlis. 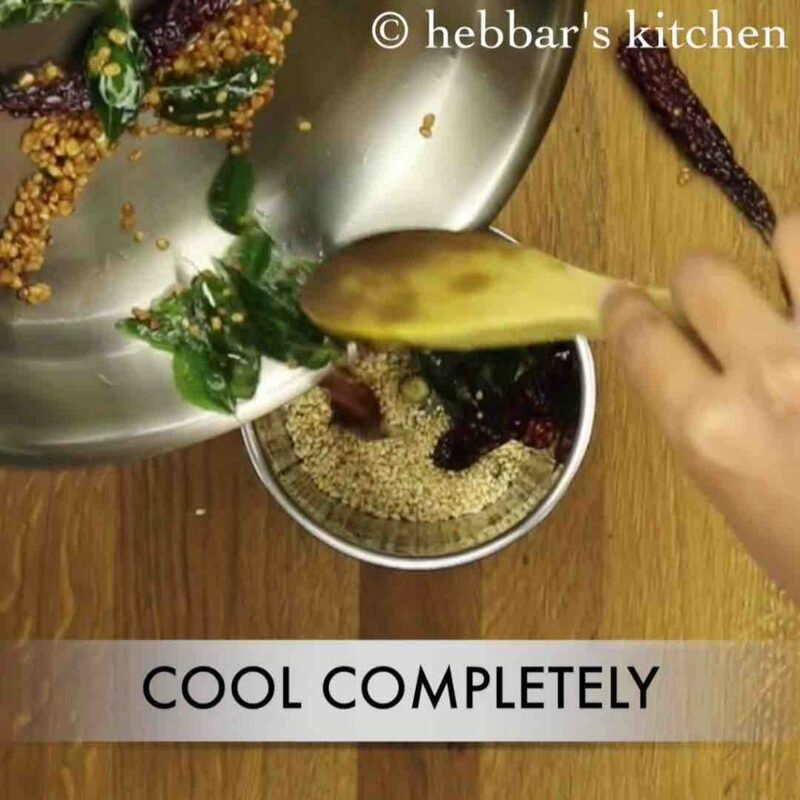 it is typically prepared in a thick consistency very similar to chutney or any festive sambar recipe. this recipe is yet again shared by my friend shreepada’s mother and many many thanks to her for sharing amazing udupi or mangalore delicacy. 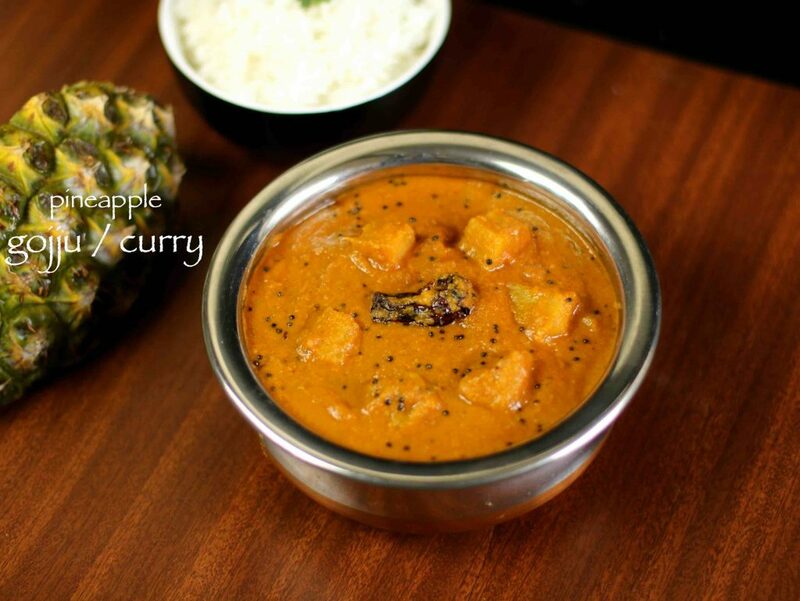 basically, this pineapple curry is very popular across karnataka and is known as ananas or pineapple menaskai in udupi and mangalore region. it is also known as pineapple gojju in bangalore and mysore region. perhaps due to the thick consistency the word gojju may have been attached to this recipe. 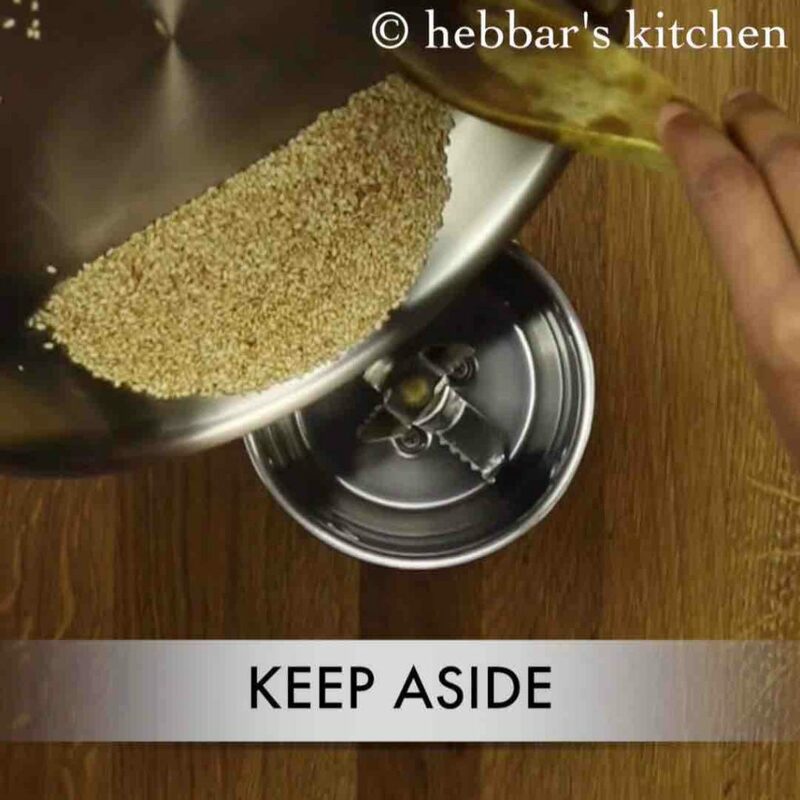 i personally like this recipe as side dish idli or kadubu rather than steamed rice but trust me it tastes great for both. furthermore some important tips and recommendations for this amazing ananas menaskai recipe. 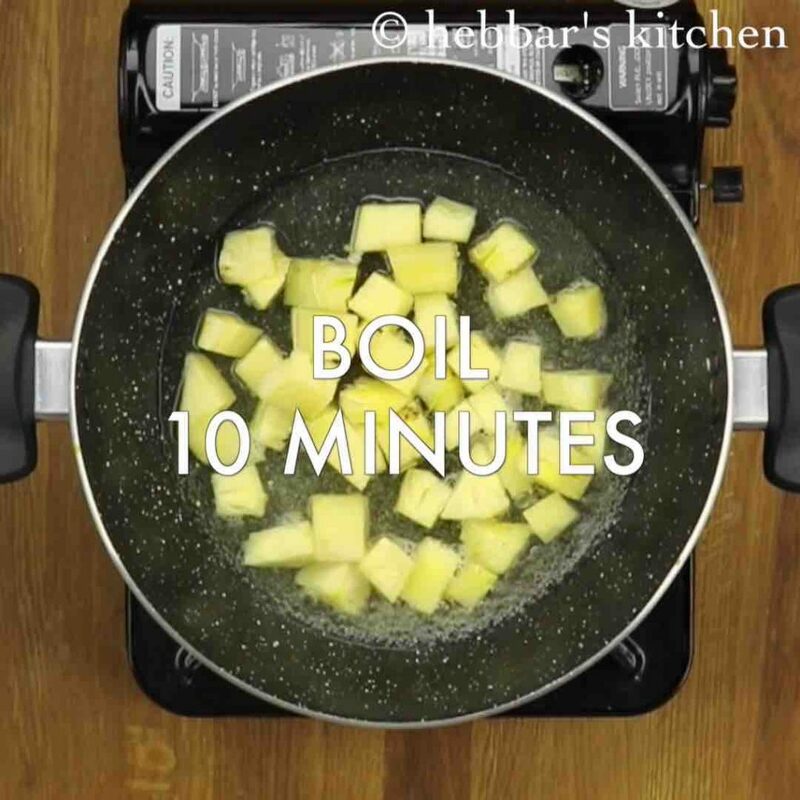 firstly, make sure to select ripe and juicy pineapple or ananas for this recipe. my pineapple was moderately sweet and sour and hence i derived the below proportion of ingredients for pineapple curry. 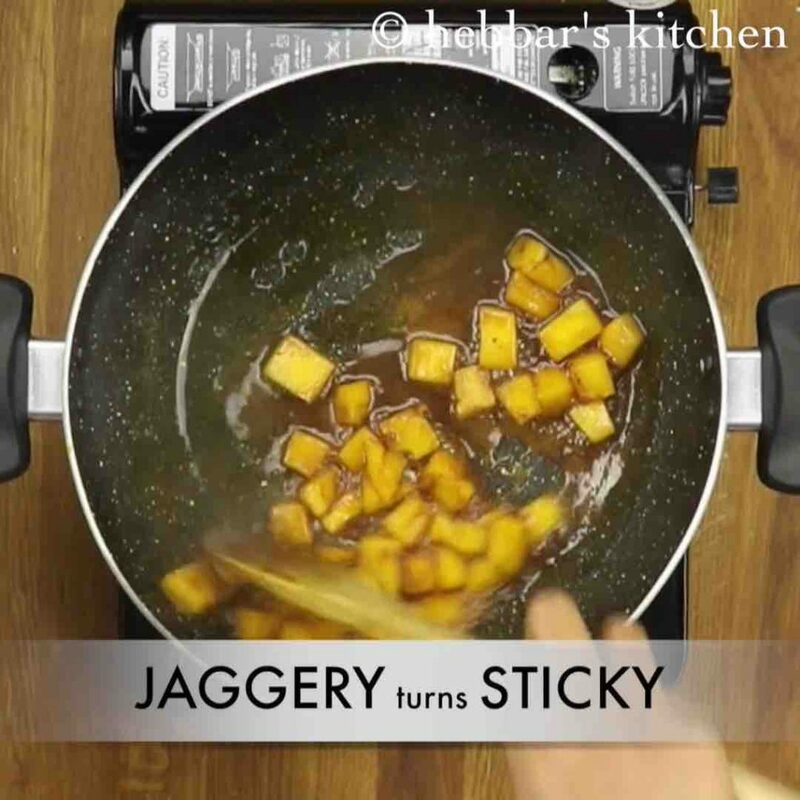 in addition, if you end up having sour pineapple, the jaggery quantity may have to be increased accordingly. further the tamarind quantity may have to be decreased due to the sourness of pineapple. 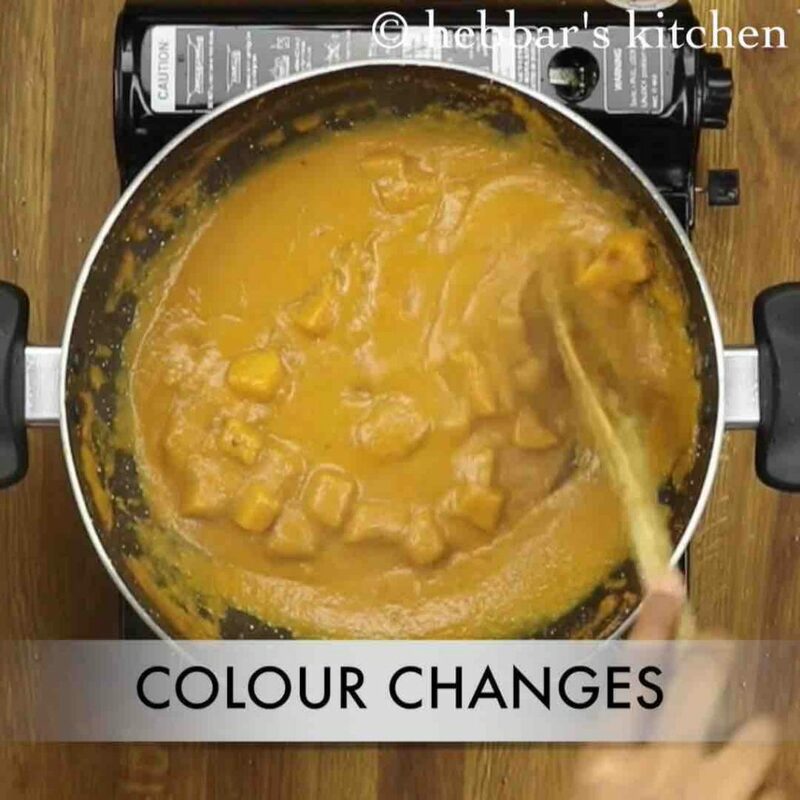 lastly, the same recipe can be followed with sweet mangoes, raw mangoes and even with bitter gourd. 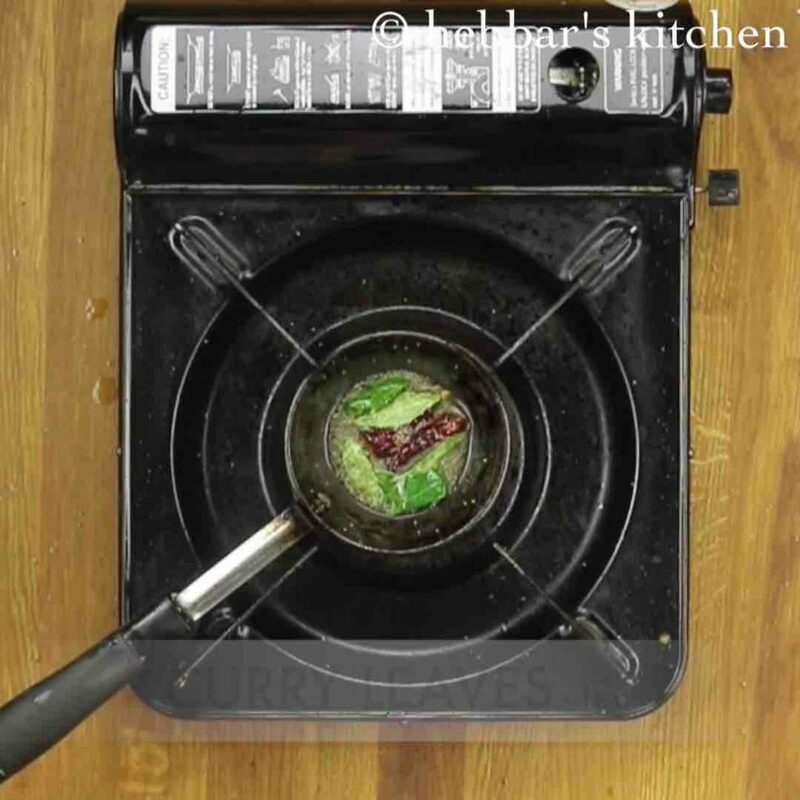 firstly, in a large kadai boil 1 cup of chopped pineapple with 1 cup of water for 10 minutes. 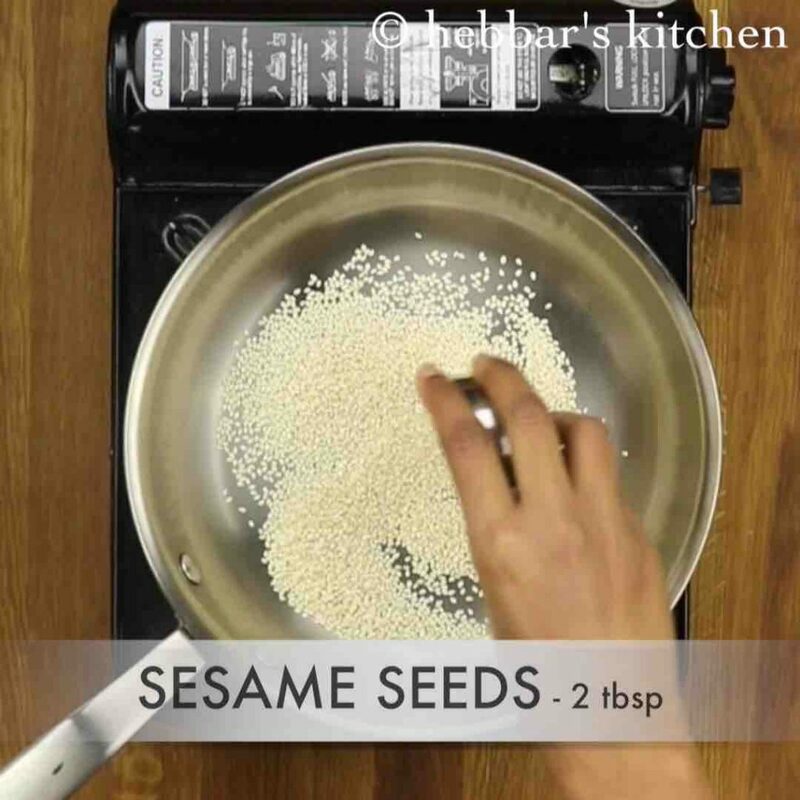 meanwhile, prepare the masala by dry roasting 2 tbsp sesame seeds. 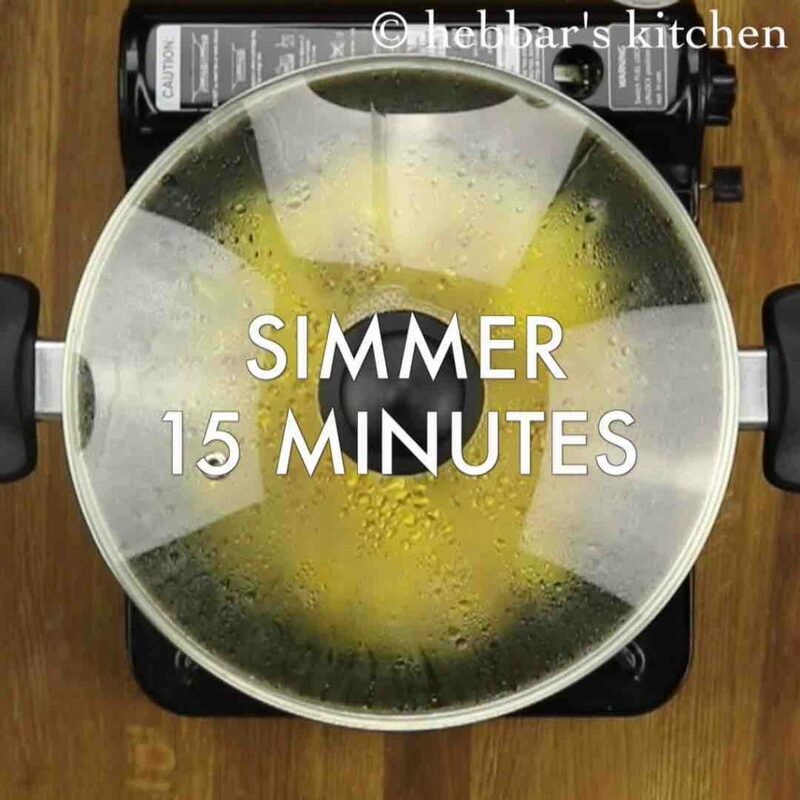 transfer to the blender and keep aside. 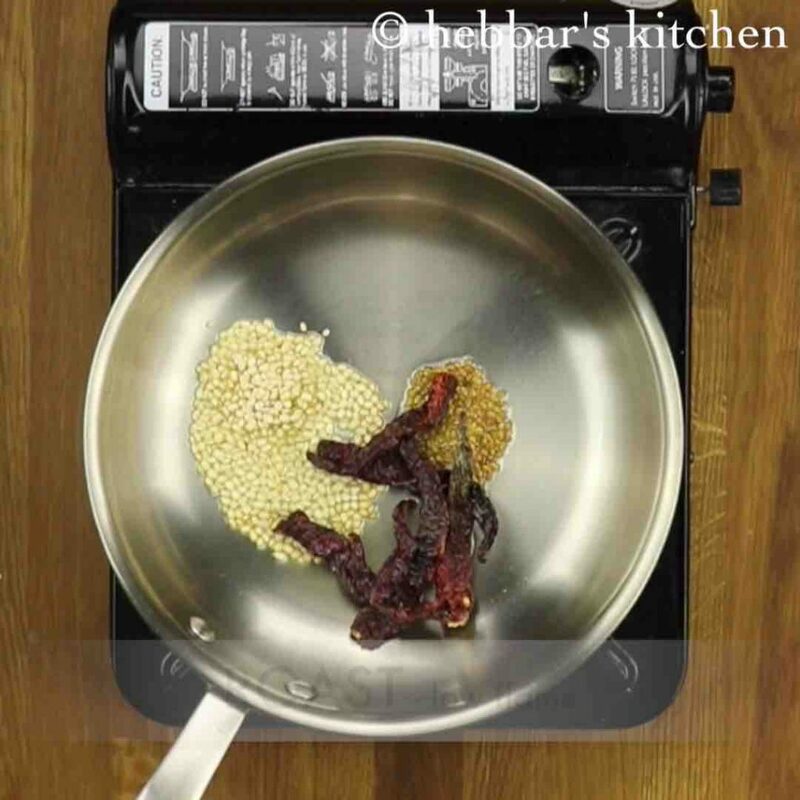 furthermore, roast 2 tsp urad dal, ½ tsp methi, 6 dried kashmiri red chilli with a tsp of oil. 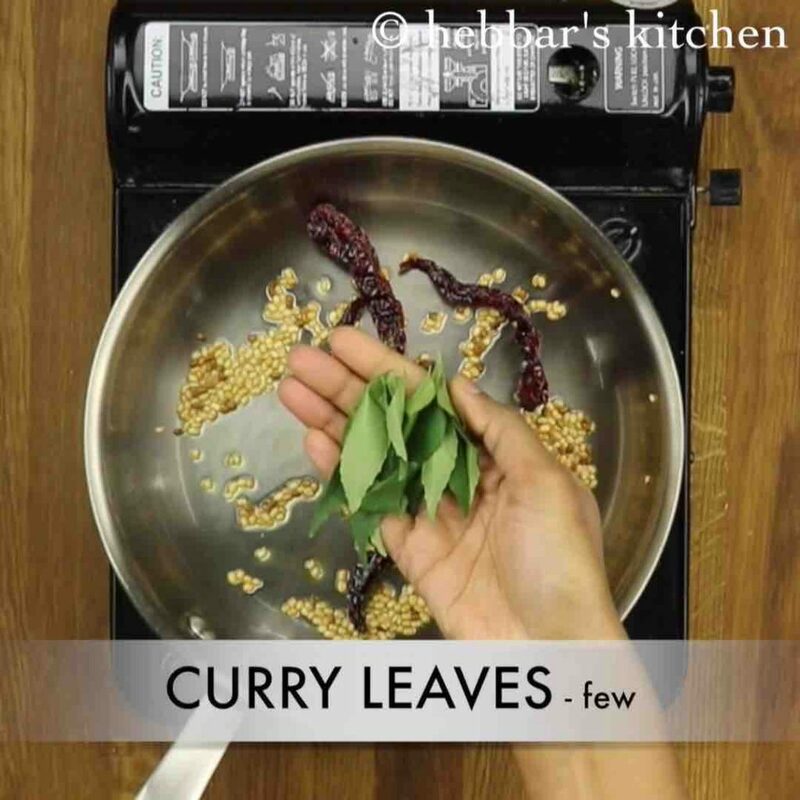 also add in few curry leaves and roast till they turn crisp. 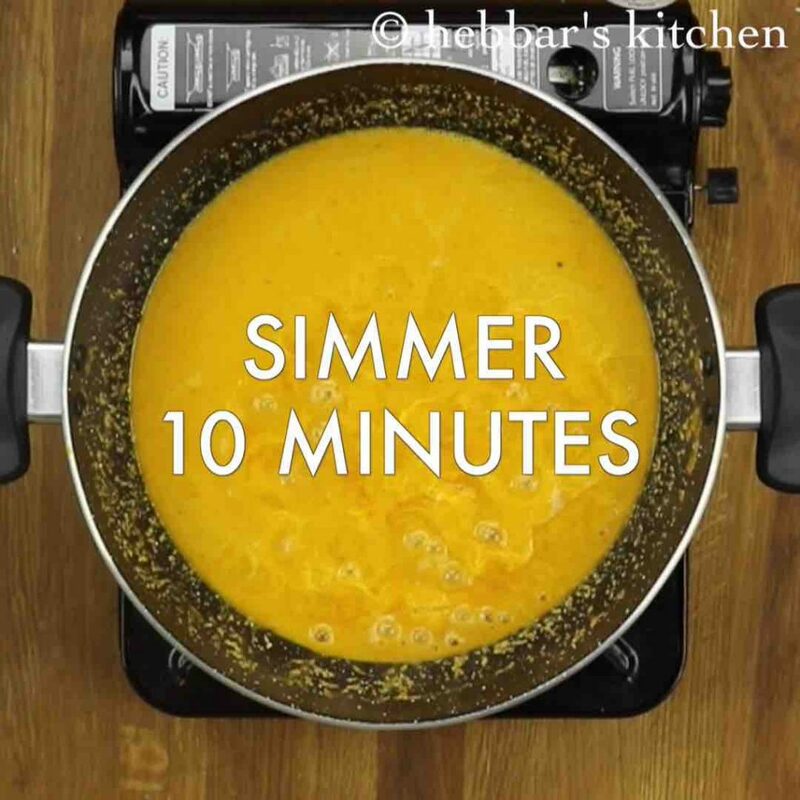 transfer to the blender and allow to cool completely. 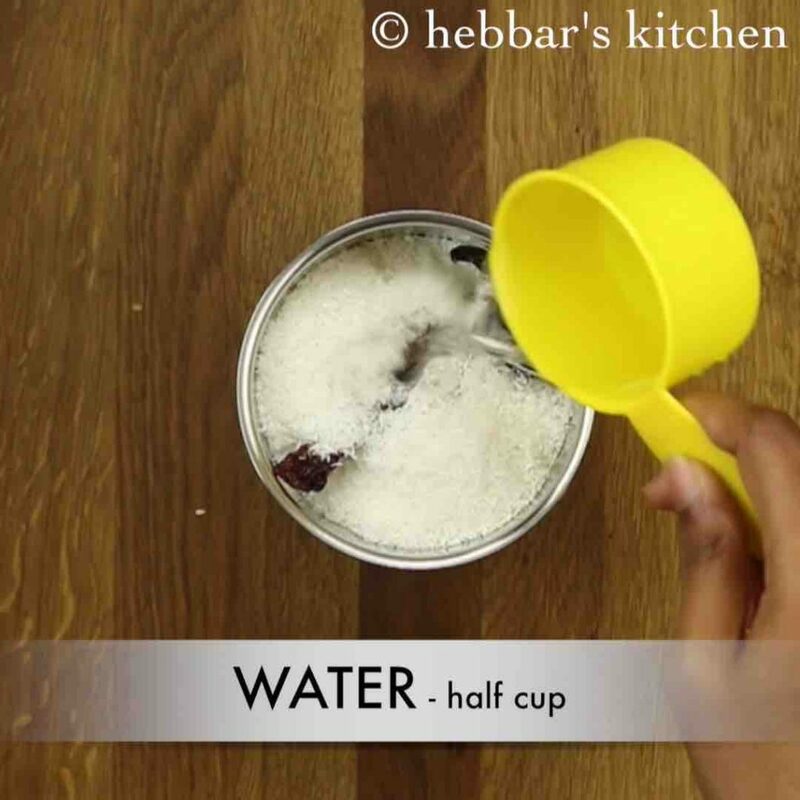 additionally, add ¾ cup coconut and ½ cup water. 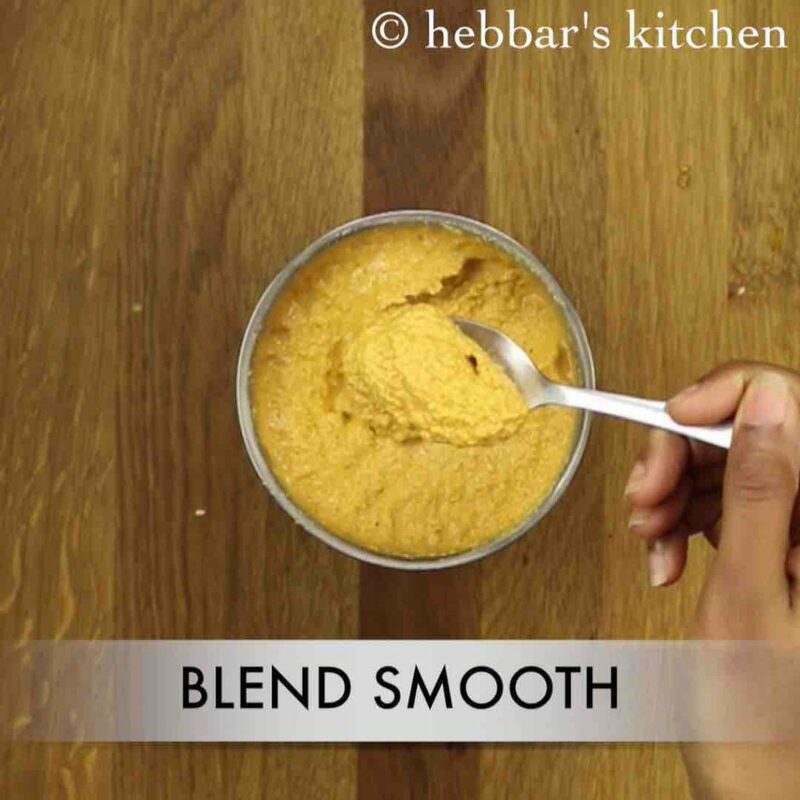 blend to smooth and fine paste adding more water if required. keep aside. 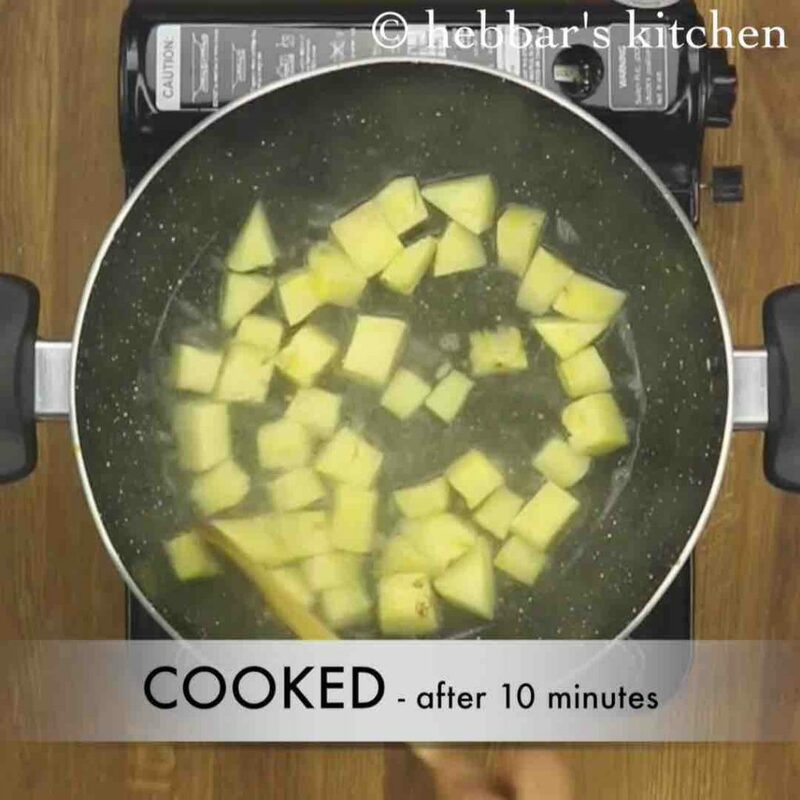 after 10 minutes, pineapple has cooked almost. 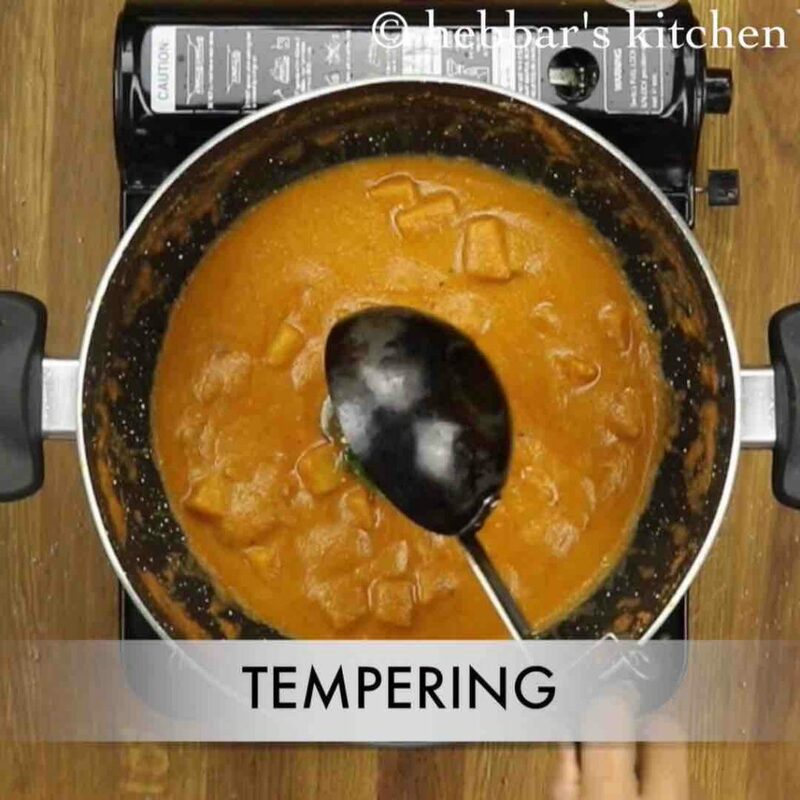 add in ¼ cup tamarind juice 5 tsp jaggery, ½ tsp turmeric and salt to taste. 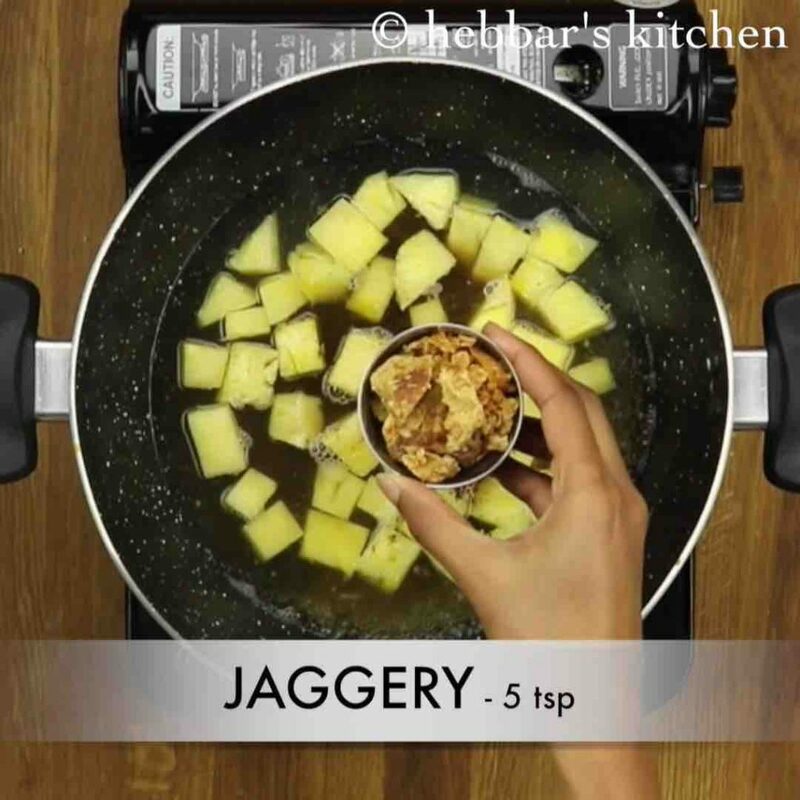 or boil till the jaggery turns slightly sticky and thick. now prepare the tempering by heating oil. add in 1 tsp mustard seeds, 1 broken dried kashmiri red chilli and few curry leaves. allow to splutter, and pour over menaskai. firstly, boil on low flame for long time to get more rich flavours. additionally, adjust the sweetness, sourness and spiciness based on pineapple. 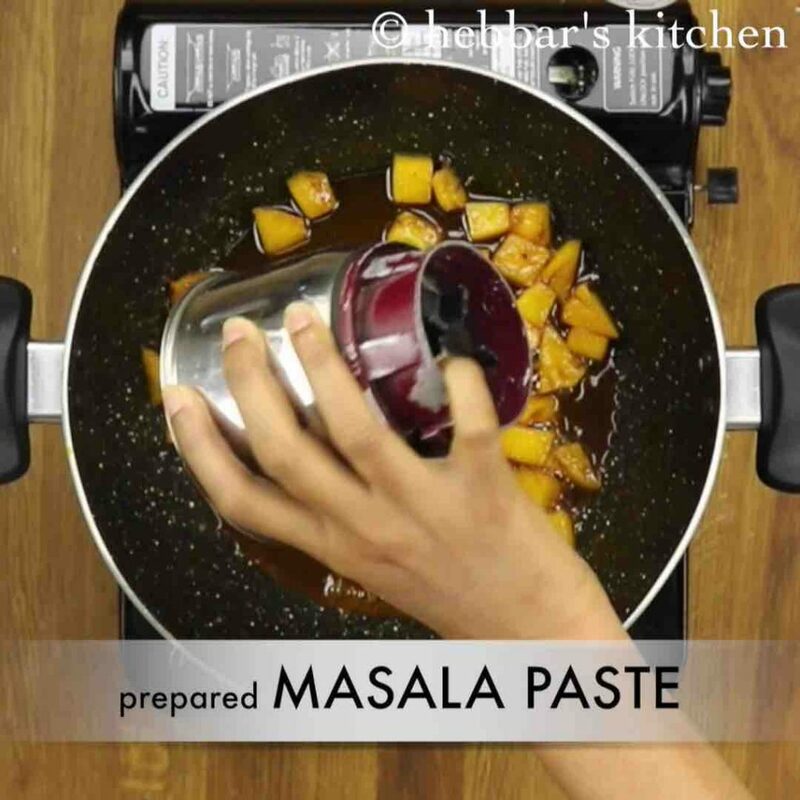 furthermore, substitute with raw mango / bitter gourd to prepare with different flavours. finally, enjoy tangy, sweet and spicy pineapple gojju or refrigerate for atleast 3 days. 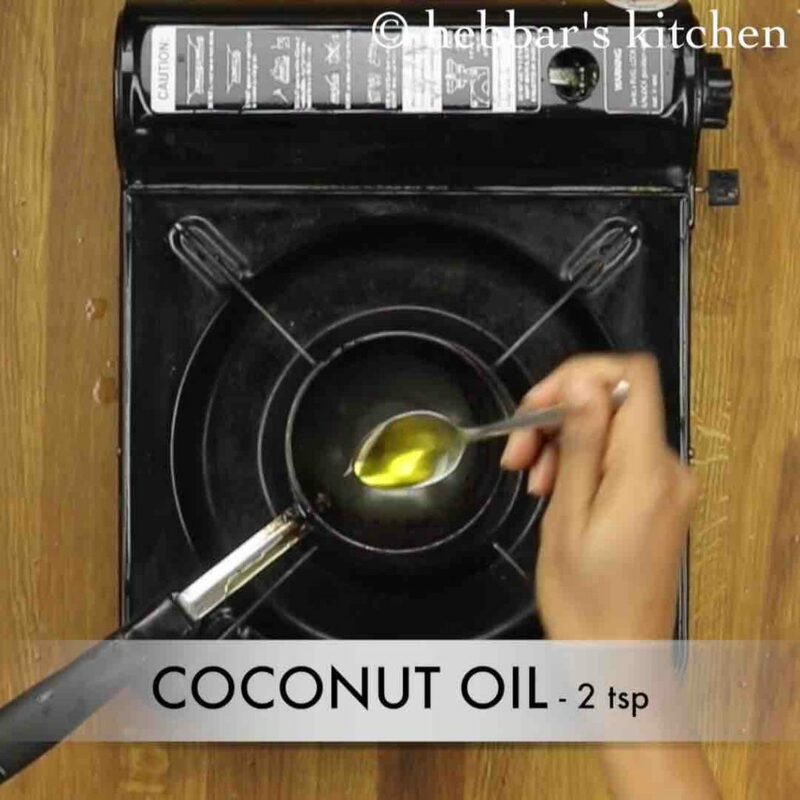 Can this recipe made with bhendi, if yes please guide me, how to avoid the stickyness from bhendi. you can use mango or karela/ bittergaourd instead of pine apple.. Thanks for the recipe.. I was waiting for this since long time.. My favorite..